From South Africa, Swaziland and Lesotho, Kalanchoe thyrsiflora Flapjacks (see picture right). 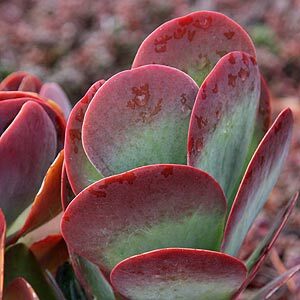 This is a colourful succulent with wonderful colour especially in winter when the red paddle like foliage are at their best. It does flower, with small fragrant flowers in spring, however it really is the foliage that these wonders are grown for. Reaching a height of 50cms this is a versatile plant that can be grown in a well drained sunny position in the garden, or in a container indoors. An excellent choice for the rock garden, or in a large container outdoors. In a container ensure that you are using free draining succulent potting mix, and also ensure that the container has adequate drainage holes. Also excellent for a hanging basket. Remember that these plants like sun, the more sun the better the foliage colour, in shaded areas they will be green, red and orange in the sun with green in the deeper folds. Do not over water, in fact in good conditions these plants need very little to no water at all except in dry summers. They also appreciate a dry winter. In cooler areas plants will need protection from frost. Do not mist or spray foliage as this can cause problems.